If you haven’t visited the GHIN website in some time then you might be surprised to know that you can do a lot more than just post scores and lookup handicaps. GHIN recently introduced eGolfer, an online service designed to assist players in organizing their game and their golf network. eGolfer is free and is available to all members of the Texas Golf Association. Just a few of the great new features of eGolfer include MyStats, MyEvents, MyCourses, and MyWeather. And because eGolfer can be customized through the Zip Code setting, an individual will only receive news, weather, and other information relevant to their area. 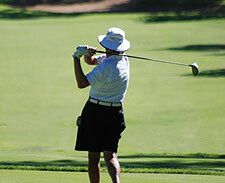 They can even search for other local golfers to arrange a game. But of all the great tools inside eGolfer, perhaps the most popular is MyStats, which provides golfers with the ability to track their own stats and print them out in bar or graph form. A sampling of some of the stats a player can keep track of are hole-by-hole scores, total number of putts, fairways hit, greens hit and sand saves. Combined with a golfer’s scoring history, it’s a great tool for measuring progress or seeing what areas need work. So, interested in becoming an eGolfer? It’s easy to sign up. All you have to do is log on to GHIN.com and look on the right hand side of the screen for the eGolfer sign-in box. Click on “Create A Profile” and you’re ready to get started. Please note that you can still post your scores online and lookup your Handicap Index via the new GHIN.com Website without signing up for eGolfer. All of the functionality from the old GHIN.com Website is still available. You do not have to sign up for eGolfer to access these services. To post a score online, click on “POST SCORES” from the top navigation bar. To perform a Handicap Lookup, click on “HANDICAP LOOKUP” from the top navigation bar. You may also download the free GHIN mobile app and perform handicap lookups or post scores from your smartphone.